Can a tiny pretender to GarageBand's throne best Apple's app? NanoStudio's arrival on the iPhone in July was swiftly followed by MacFormat scurrying off to a darkened room, to spend hours composing exciting electronic music. The £8.99 app was a revelation – loads of great built-in voices, a six-track sequencer, effects, live recording and pattern editing – and it made redundant the need for GarageBand on iOS. 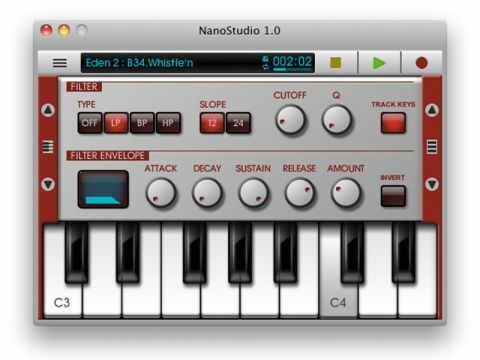 With the app being pricey, the developer decided to create a 'demo' for PC and Mac, which became NanoStudio 1.0. What you get with NanoStudio for the Mac is essentially the iOS version: dozens of voices, pads and pitch-bend that can be manipulated live, knobs to twiddle and effects to apply. When you're done recording, you can edit patterns in a GarageBand-like fashion, amend the mix, and export everything as a WAV. Unfortunately, controls are accessed by mouse-clicks only – there's no Mac keyboard or USB piano-style keyboard support; and the workspace is tiny, as per the iPhone version. This makes using some aspects of the app decidedly quirky, although we still found it usable, which shows how much thought went into the iOS version. It's way more than a mere demo, but just short of classic status; but since it's free, it's still a no-brainer.